STIXTM Version 1.2.1. Part 1: Overview. Edited by Sean Barnum, Desiree Beck, Aharon Chernin, and Rich Piazza. 05 May 2016. OASIS Committee Specification 01. http://docs.oasis-open.org/cti/stix/v1.2.1/cs01/part1-overview/stix-v1.2.1-cs01-part1-overview.html. Latest version: http://docs.oasis-open.org/cti/stix/v1.2.1/stix-v1.2.1-part1-overview.html. Copyright © OASIS Open 2016. All Rights Reserved. The objective of the Structured Threat Information Expression (STIXTM) effort is to specify, characterize, and capture cyber threat information. STIX addresses a full range of cyber threat use cases – including threat analysis, capture and specification of indicators, management of response activities, and information sharing – to improve consistency, efficiency, interoperability, and overall situational awareness. [STIX-W] Barnum, S., “Standardizing Cyber Threat Intelligence with the Structured Threat Information eXpression (STIXTM),” The MITRE Corporation, Bedford MA, Feb. 20, 2014. [Online]. Available: http://stixproject.github.io/getting-started/whitepaper/. 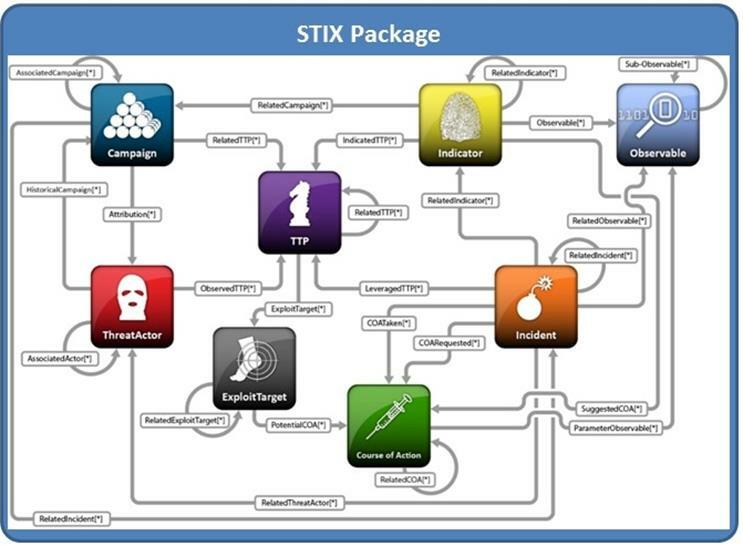 Individual component data models define objects specific to each top-level STIX component construct: Observable (defined in the CybOXTM Core data model); Indicator; Incident; Tactics, Techniques, and Procedures (TTPs); Campaign, Threat Actor, Exploit Target; Course of Action; and Report. 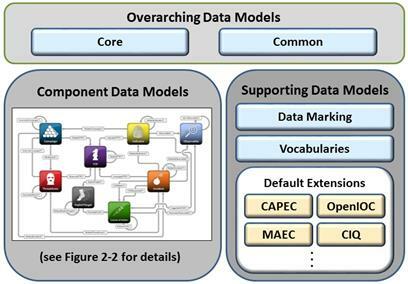 These data models each provide the capability to fully express information about their targeted conceptual area. In the STIX framework, they are all optional and may be used separately or in concert, as appropriate, using whichever components and architectural relationships that are relevant for a given use case.